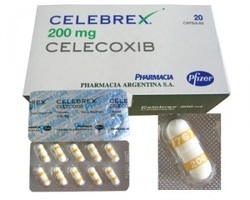 Celecoxib is useful in treating inflammatory condition such as rheumatoid arthritis and osteoarthritis. Celexocib is part of an anti inflammatory reaction. Celecoxib inhibits COX 2 or cyclooxygenase 2 which reduces the inflammatory reaction. Celecoxib will reduce the synthesis of prostaglandin. COX 2 may present in any inflammation sites. Celecoxib is different from other forms of NSAIDS as celecoxib will selectively inhibit only COX 2 which reduces the side effects of COX 1 inhibition such as peptic ulcer. The common side effects of celecoxib, are interstitial nephritis, gastrointestinal upset, low chances of developing peptic ulcers, strokes and allergic reactions.